Background: Swarna Makshika (SM) is a brassy golden yellowish mineral with chemical composition of CuFeS2that is widely used in therapeutics to treat various disease conditions such as Prameha (diabetes), Panḍu (anemia), Kushtha (skin diseases) and Jwara (fever). This mineral needs to be processed by the following specified Ayurveda guidelines in order to make it therapeutically safe and more potent. These processes include Shodhana (preliminary process of eliminating unwanted substances), Marana (incineration) and Amritikarana (nectorization) that are mandatory and play a crucial role in therapeutics. However, till date, no published reports are available on standard manufacturing procedure of SM Shodhana. Objective: The objective of this study is to develop the standard manufacturing procedure of SM Shodhana. Materials and Methods: Methods described in Rasaratna Samuchhaya were followed to perform Shodhana process. Shodhana of SM was carried out in three batches (600 g in each batch) by seven quenching in Triphala Kwatha (TK, decoction of Terminalia chebula Retz., Terminalia bellirica Roxb. and Phyllanthus emblica Linn.) maintaining batch manufacturing records. Organoleptic and physicochemical analysis of media, i.e., TK and SM was carried out. Results: After Shodhana, golden yellowish luster of SM was completely lost and it turned into dark black coarse powder. The hardness went on decreasing and brittleness went on increasing. Average 532 g of Shodhita SM (88.67%) from 600 g of SM was obtained. Average time required for achieving red hot stage was 24.81 min. Analysis of the media revealed an increase in pH, specific gravity, and total solid contents. Conclusion: The adopted method for Shodhana of 600 g of SM can be considered as easy, convenient and standard. Ayurvedic system of medicine has its own methodology of drug manufacturing with the highest care toward safeguarding of products. 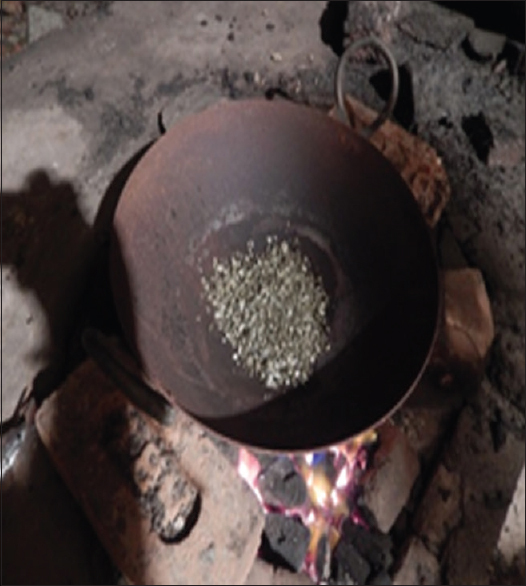 The quality of prepared Bhasma (incinerated mineral) depends on the quality of raw material and standard manufacturing practices followed during its preparation. Standardization techniques help in ensuring safety and efficacy of the product. Different pharmaceutical processing techniques such as Shodhana (preliminary process of eliminating unwanted substances), Marana (incineration), Jarana (roasting) and Amritikarana (nectorization) are mandatory for manufacturing of Ayurveda medicines, especially when a formulation contains metals or minerals or some poisonous substances in its composition. Shodhana process is said to remove soluble impurities from raw material, adds some organic materials, and reduces toxicity to the great extent. Swarna Makshika (SM) is an important mineral used in Ayurveda medicines and Swarna Makshika Bhasma (SMB) possesses Vrishya (aphrodisiac), Rasayana (immunomodulation), Yogavahi (targeted drug delivery), Swarya (good for voice) and Chakshushya (helpful in eye diseases) properties. It alleviates disorders caused by Tridosha (Vata, Pitta, and Kapha) and is widely used in the treatment of various diseases such as Kshaya (emaciation), Prameha (diabetes), Basti Shoola (bladder pain), Pandu (anemia), Shotha (edema) and Kushtha (skin disorders). This mineral needs to be processed (Shodhana) meticulously before its conversion into Bhasma, and if used in impure form, it manifests a few untoward effects such as Agnimandya (dyspepsia), Vanti (vomiting), Vibandha (constipation), Krimi (worm infestation), Vrana (ulcer), Kushtha (skin disorders), Netraroga (eye diseases), Daurbalya (generalized weakness), Kshaya (emaciation), Balanasha (loss of strength) and even Marana (death)., Hence, its processing in terms of Shodhana becomes must to make it more potent therapeutically. Earlier scholars have documented on the pharmaceutical methods, but their observations were not comprehensive. Hence, this study is designed to put forward and ensure that those shortcomings are addressed. Earlier scholars have worked on pharmaceutical preparation of SM Bhasma with Nimbu Swarasa (fresh lemon juice) and Saindhava Lavana (rock salt) as Shodhana media., Around 26 different methods of SM Shodhana are found in Ayurveda texts that can be categorized into five basic methods, namely Swedana (boiling), Bharjana (frying or roasting), Nirvapa (heating and quenching), Mardana (trituration) and Putapaka (incineration). These procedures use more than 35 liquid media. Among these liquids, Triphala Kwatha (TK) is more frequently used, easily available, and affordable too. Triphala is also emphasized as an Anupana (vehicle) for SMB. Hence, using TK as media in the processing may also enhance therapeutic qualities of SMB. Considering this, an attempt has been made to develop standard manufacturing procedures of SM Shodhana by Nirvapa in TK by following the classical methods. 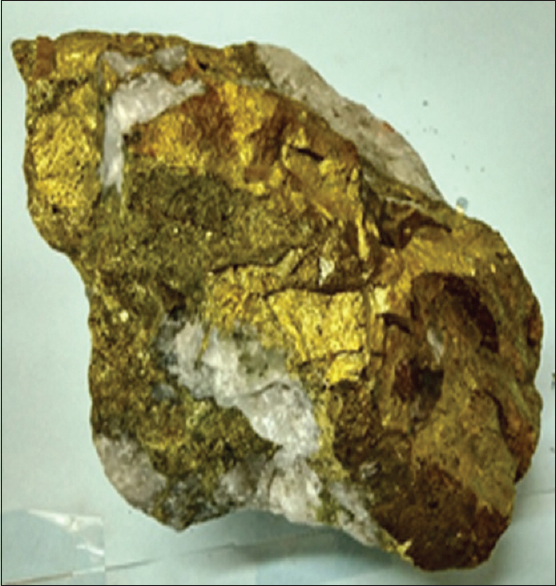 Raw samples of SM were collected from central hang wall of Malanjkhand copper project, Balaghat district, Madhya Pradesh, India, and identified to have all acceptable characters such as Swarna Sannibham (having golden color and luster), Guru (heaviness), Snigdha (smooth), Nishkona (devoid of angle), and Kalimam Vikirettattu Kare Ghrushtam (leaves a black impression when rubbed on palm or white paper) [Figure 1]., Ground level of the sample collection area was 580 mean reduced level (mRL) and sample was collected from 380 mRL. Collected samples were quartz reef mineralization of chalcopyrite and pyrites. Dried Triphala (pericarp of Terminalia chebula Retz., Terminalia bellirica Roxb., and Phyllanthus emblica Linn.) was procured from Pharmacy, Gujarat Ayurved University, Jamnagar. The procedure of Shodhana was divided into two stages. 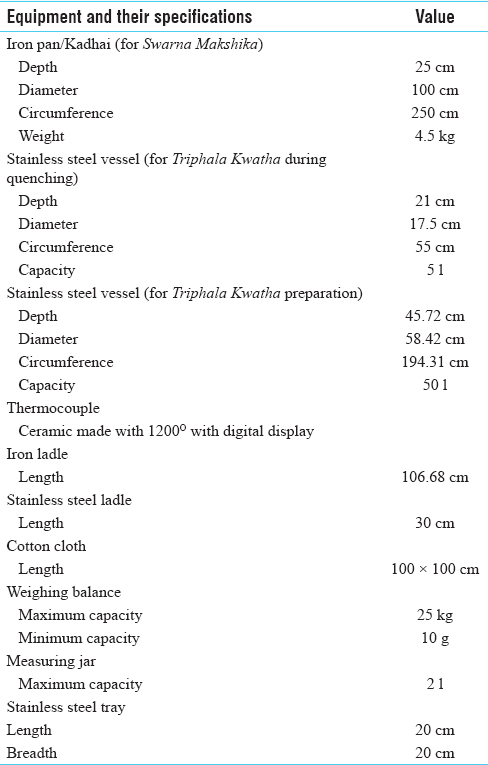 Individually coarse powder (#10) of Triphala was prepared and collected into a stainless steel vessel. The contents (4.2 kg) were added with eight parts (33.6 l) of potable water and left undisturbed overnight. On next morning, the contents were boiled over mild flame maintaining temperature in between 85°C and 95°C and reduced to one-fourth (8.4 l) of its initial volume with constant stirring. The contents were filtered through clean muslin cloth to obtain decoction. Raw SM was taken in a clean and dry Khalva Yantra (mortar and pestle), pounded well to prepare ½–1-cm small crystals [Figure 2], shifted to a clean and dry iron pan, and subjected to intense heat in charcoal furnace at about a temperature of 800°C–850°C [Figure 3] and [Figure 4]. Subsequently after achieving red hot stage [Figure 5], it was quenched in another vessel containing TK [Figure 6]. After self-cooling, SM was collected from the Kwatha and dried and the process of quenching was repeated for six more times. At the end of the seventh procedure, the contents were collected carefully, shade dried, powdered, labeled, and stored in airtight containers for further use [Figure 7], [Figure 8], [Figure 9]. The brief video of Unit Operative procedure of Swarna Makshika Shodhana was also created for clear perception. The whole process was repeated in two more batches. Each time fresh and same amount of TK was taken. Temperature and volume of media before and after quenching were noted. Temperature of coal and SM was monitored by electric digital pyrometer. Weight of SM before and after quenching was noted. Organoleptic characters, i.e., color, odor, taste and feel of drug upon touch by sensory observations of SM as well as TK before and after Shodhana were noted. Physicochemical parameters of TK such as pH, specific gravity (Sp. Gr.) and total solid content were determined before and after each Nirvapa. pH (5% aqueous suspension), loss on drying and ash value of raw and Shodhita SM were carried out according to standard methods as mentioned in the Ayurvedic Pharmacopoeia of India. 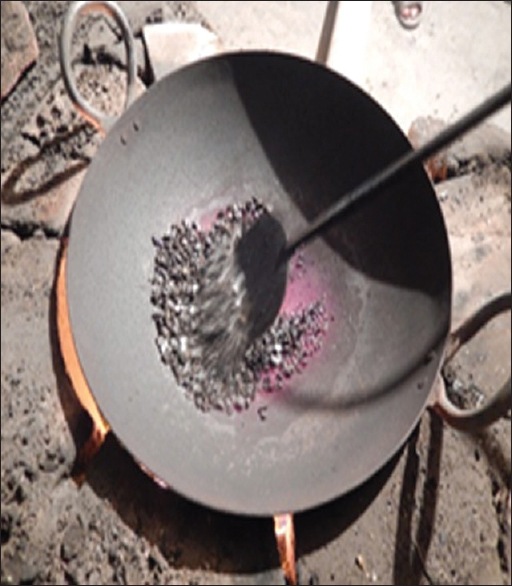 During SM Shodhana, specific crackling sound was observed when SM was heated during the first quenching process, and few small particles of SM were escaping from the iron pan. Characteristic smell and fumes of sulfur (sulfur dioxide) were observed during the process. 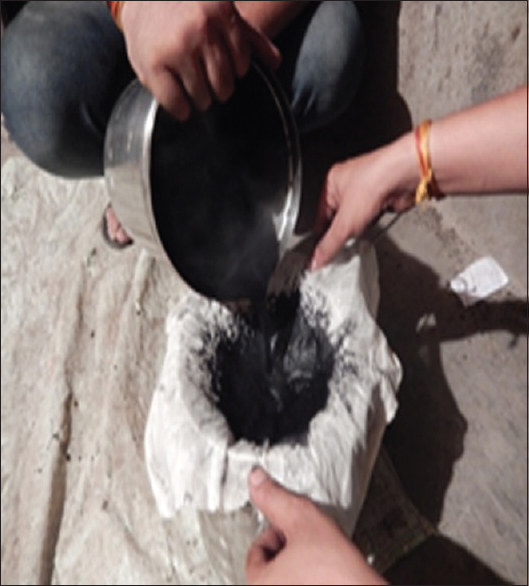 Sulfur fumes were found increased at the time of red hot stage of SM and complete cessation of sulfur fumes was observed during the seventh Nirvapa. As sulfur fumes produce irritation to the nose and throat, precautions should be taken during the Shodhana process. Brassy golden yellowish SM changed to black after the first and second Nirvapa and turned to blackish red by the fourth Nirvapa. By the end of the fifth Nirvapa, it turned to dark black coarse powder. Brown-colored TK was turned to dark black and its consistency became thicker. Characteristic odor was observed during quenching. Some particles were stuck to the vessel after quenching which needed to collect carefully. 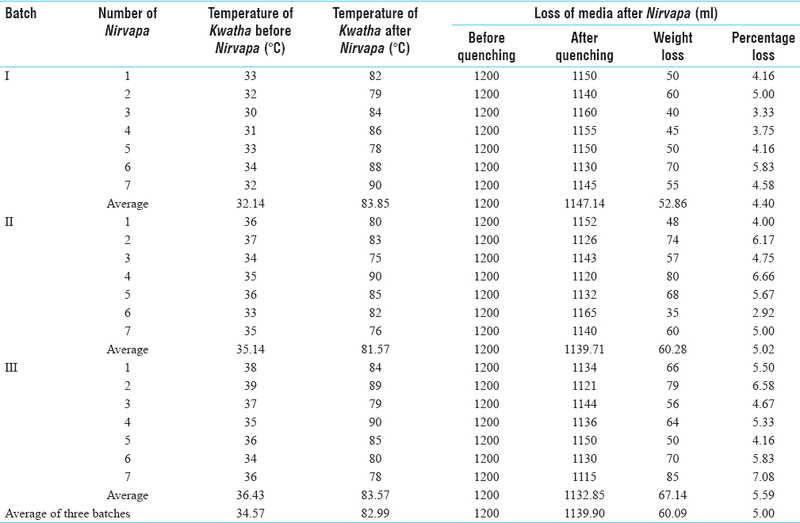 Details along with results obtained during Nirvapa process, changes observed in the media, and organoleptic characters of SM and TK are depicted at [Table 1], [Table 2], [Table 3], while the changes in physicochemical profiles of media and SM has been presented in [Table 4] and [Table 5] and the equipment specifications in [Table 6]. Shodhana is a procedure of elimination of Dosha (impurity/toxicity/flaw) from the drug. The term Dosha indicates not only impurities but also all that which makes the drug unsuitable for further process or therapeutic use. In case of metals and minerals, it is a physicochemical and therapeutic transformation of a substance making it feasible for the next process (Marana) or directly for therapeutic use. It is a mandatory process of metals and minerals that help to expose maximum surface area of drug for chemical reactions and also in impregnation of organic materials and their properties into the drug. This makes the mineral brittle and helps in particle size reduction. There are different types of Shodhana methods mentioned in Ayurveda, and Nirvapa is one among them. During Shodhana, gravimetrically double amount of TK was taken for quenching. This requirement may change depending on the vessel specifications. Ideally, cylindrical vessels with suitable wide mouth will be justifiable. Ideally, quantity of liquid should be sufficient enough to completely immerse the material being quenched. The process of Nirvapa was carried out first by making pieces of SM crystals approximately in ½–1-cm dimensions. Big pieces of SM could not get red hot because of their size during Nirvapa process. Considering this, a powder (60# mesh) form of SM was attempted that was adhering to the iron pan and leading to difficulty in quenching and significant loss. Hence, in subsequent practicals, crystals of approximately ½–1 cm were prepared, and the same process was repeated. 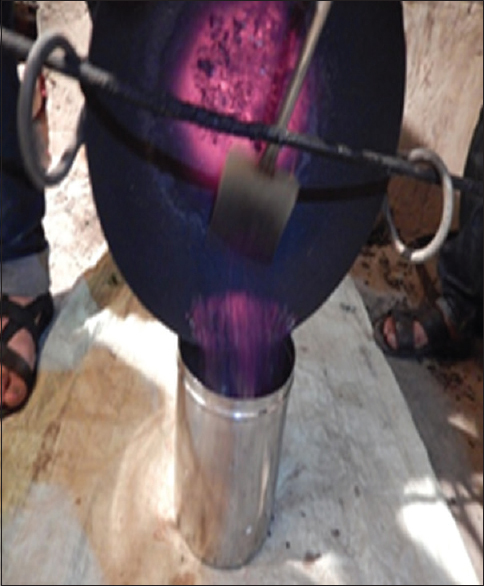 It was observed that particles of SM became red hot uniformly and do not adhere to the iron vessel and suitable for Nirvapa. While performing Nirvapa, strong sulfur smell was observed from the first to the fourth cycle of quenching that was due to sulfur dioxide (SO2) vaporization and oxidation of SM. From the fifth cycle onward, the intensity of odor was reduced, and by the seventh cycle, no odor was observed. At early stages of Shodhana, cracks were seen on the surfaces of SM flakes, and finally, some coarse powder was observed. Repeated heating and cooling of SM flakes causes disruption in compression-tension equilibrium and leads to cracks on the flake surface (stress corrosion theory). During red hot state, different compounds such as pyrrhotite (Fe1−xS), pyrite (FeS2), bornite (Cu5 FeS4) and chalcocite (Cu2S) will be formed on the surface of SM flakes. Theory of thermal expansion states that expansibility differs from metal and mineral to compound on heating. In general, expansibility of compound is less than metal. Hence, repeated heating leads to breaking of SM flakes into coarse to fine powder. Copper and iron are converted to oxide form at red hot state by reacting with atmospheric oxygen. 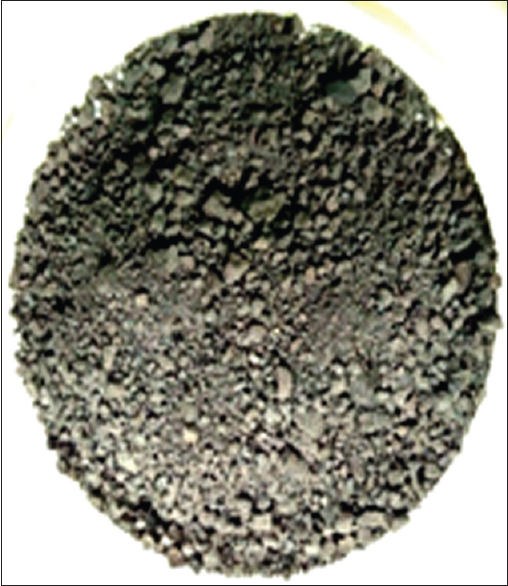 Studies reported oxidized iron and copper compound as Fe2O3(ferric oxide) and CuO (cupric oxide), and rest sulfides are FeS2(iron disulfide), FeSO4(ferrous sulfate), Cu2S (cuprous sulfide) and CuS (copper sulfide). Raw SM may contain physical impurities such as unwanted rock or gangue minerals, typically silicate minerals, or oxide minerals for which there is often no value. These visible impurities were removed by hand picking method before Nirvapa. SM is often found with a variety of other trace elements such as cobalt (Co), nickel (Ni), manganese (Mn), zinc (Zn) and tin (Sn) substituting for copper and iron (Fe), selenium (Se) and arsenic (As) substitute for sulfur and trace amount of silver (Ag), gold (Au), platinum (Pt), lead (Pb), vanadium (V), chromium (Cr), indium (In), aluminum (Al) and antimony (Sb)., It is most likely that many of these elements are present in finely intergrown mineral within the SM (chalcopyrite). During the process of red hot in iron pan on high temperature, chemical impurities such as extra sulfur in the form of sulfur dioxide (SO2) and arsenic may be get vaporized while other get oxidized and after heating, it was instantly quenched in the TK. It facilitates the media to enter inside the drug easily by which the remaining blemishes will get separated or dissolved in the liquid media as well as the therapeutic property of TK introduced into SM. Instant quenching is important because repeated immediate cooling after heating leads to breaking of the material. 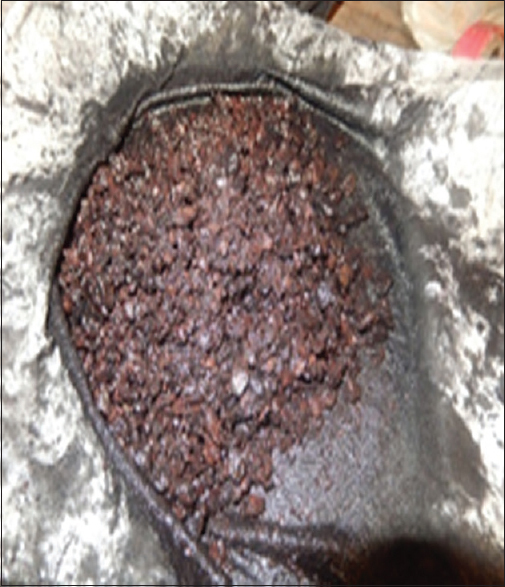 Yellowish and golden shining of SM was lost completely after Shodhana process and turned into dark black coarse powder. An average temperature of SM in red hot stage was noted as 425.28°C. Average time required to get red hot was noted around 24.81 min. There was a continuous decrease in the period of reaching to the red hot stage of SM during first to seventh process of Nirvapa, which may be due to the conversion of oxides and sulfides of SM. At a later stage of Shodhana, surface area of SM was increased due to repeated heating and quenching. Hence, SM took less time to become completely red hot [Table 1]. An average loss of SM was noted as 68 g (11.33%) after Nirvapa. After seventh Nirvapa, fine particles of SM were found settled to the bottom of vessel. Loss was observed during Nirvapa as some fine particles were lost through filtering and a fraction might have entered into TK. Documentation of weight changes is an essential part for the drug standardization. Assessment of final weight with relation to initial weight will give an idea to choose the weight of the initial material to procure the desired quantity of finished product. Large-scale production will substantially decrease the expenditure in relation to the quantity as the expenditure on labor is not going to change by increasing quantity up to some level. The formation of oxides scales is also responsible for increase in pH after every purification steps. Oxides (Fe and Cu oxides) are mainly basic in nature, so it can raise the pH after every quenching. Specific gravity of TK before Nirvapa was 1.057 and after Nirvapa was 1.074. Specific gravity is defined as the weight of a given volume of the liquid at the stated temperature as compared with the weight of an equal volume of water at the same temperature. Increase of specific gravity in TK after Nirvapa is due to the presence of SM particles in TK. 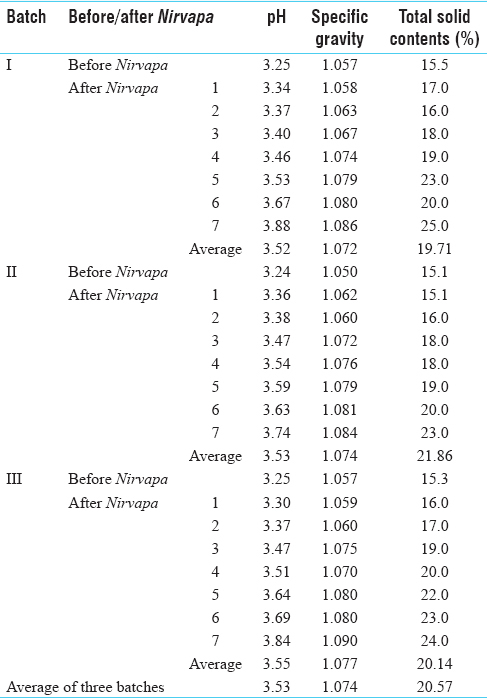 Total solid content of the TK before Nirvapa was 15.5 and after Nirvapa was 20.57. The total solids are the measure of the combined content of all inorganic and organic substances contained in a liquid. The soluble content determines the amount of constituents in a given sample of drug. Total solid content of the media after Shodhana procedure were increased slightly just because of the fine particles of SM which came into it during Shodhana procedure. Analysis of the media revealed that increase in pH, specific gravity, and total solid contents [Table 4] justifies this. An average 60.09 ml (5%) loss was observed in TK, the loss which might be due to the intense heat of the material at the level of which some fraction of moisture gets evaporates. As fuel, an average 2-kg soft coal and 1-kg hard coal for each process of Nirvapa is needed. 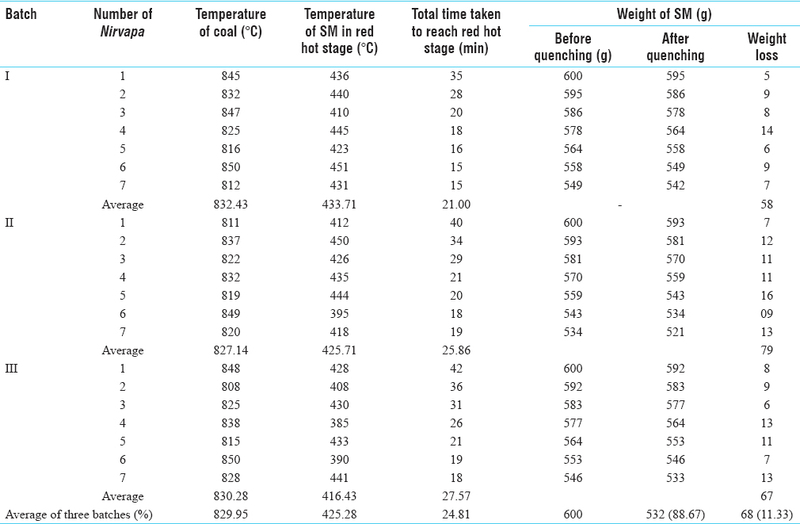 Average temperature of coal during red hot stage was noted as 829.95°C. Triphala mainly consists of tannins, gallic acid, chebulinic acid, ascorbic acid (Vitamin C) and phenolics. Ascorbate (one of a number of mineral salts of ascorbic acid [Vitamin C]) has been known to antagonize the intestinal absorption of copper. More recent studies have characterized a post absorption role for ascorbate in the transfer of copper ions into cells. The vitamin reacts directly or indirectly with ceruloplasmin, a serum copper protein, specifically stabilizing the bound copper atoms and facilitating their cross-membrane transport. Ascorbate at physiological levels and above impedes the intracellular binding of copper to Cu, Zn and superoxide dismutase. The mechanism is unclear but nonetheless suggests both positive and negative regulatory functions for ascorbate in copper metabolism., Ascorbic acid increases the bioavailability of Fe by converting Fe+3 to Fe+2, while phenolics can reduce the bioavailability of Fe by binding, for example, tannins. Excess of ascorbic acid and a lack of dietary tannins have both been suggested as contributing to clinical/pathological Fe storage disease.Triphala is a mild laxative and thereby counteracts the constipating property of iron and copper. Thus, it is mentioned in maximum Shodhana procedures of various metals and minerals. All observations should be recorded carefully during each experiment. Process standardization and quality control is a mandatory task and an essential requirement for good manufacturing practices to assure the quality and quantity of final product. Repeated quenching in the decoction of Triphala imparts some microelements that contribute to nullify possible toxic nature of raw material and help in increasing therapeutic attributes of SM. Average 88.67% yield was obtained after Shodhana. Results of the present study ensure the uniformity of the operative procedures, and those can be followed in SM Shodhana successfully. 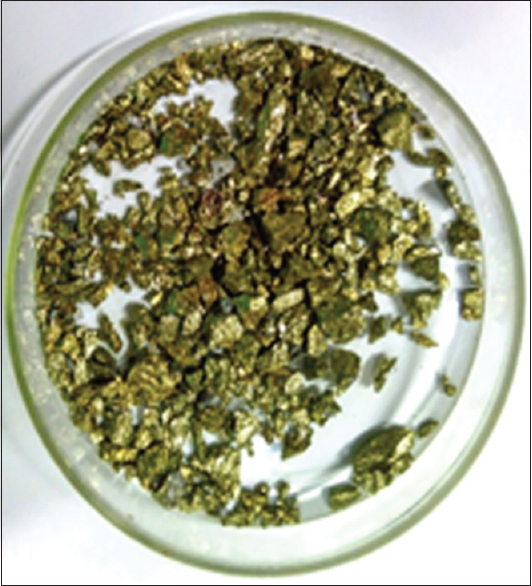 The authors acknowledge the contribution of Mr. R. M. Khan (Assistant General Manager, Hindustan Copper Limited, Malanjkhand Copper Project, Balaghat district, Madhya Pradesh, India) to identify and collect the genuine samples of Swarna Makshika (chalcopyrite). This study was financially supported by the Institute for Post Graduate Teaching and Research in Ayurveda, Gujarat Ayurved University, Jamnagar - 361 008, Gujarat, India. Singh RD, Gokarn RA, Patgiri B, Shukla VJ. Standard operating procedure of Naga Shodhana and study of chemical changes in the media and Shodhita Naga. Ann Ayurved Med 2013;2:123-32. Kashinath S, editor. Rasatarangini of Sadanand Sharma. Ch. 21, Ver. 26-28. 11th edition. Delhi: Motilala Banarasidas; 2012. p. 524. Mishra G, editor. Ayurvedaprakasha of Acharya Madhava. Ch. 4, Ver. 1-15. 2nd edition. Vatranasi: Chaukhamba Bharati Academy; 2007. p. 410. Kashinath S, editor. Rasatarangini of Sadanand Sharma. Ch. 21, Ver. 6. 11th edition. Delhi: Motilala Banarasidas; 2012. p. 520. Singh N, Chaudhary A. Pharmaceutical standardization of Swarna Makshika Bhasma. Int J Pharma Biol Arch 2013;4:361-5. Devanathan R. Pharmaceutical and Anlytical studies on Swarna Makshika Bhasma – An ayurvedic formulation. Asian J Pharma Clin Res 2013;6:26-9. Krushnkumar T, Shweta V, Prashant B, Galib R, Biswajyoti P. Swarna Makshika Shodhana – A review through rasa classics. J Ayurvea Med Sci 2017;2(2):158-64. Gulraj M, editor. Ayurvedaprakasha of Acharya Madhava. Ch. 4, Ver. 10. 2nd edition. Vatranasi: Chaukhamba Bharati Academy; 2007. p. 410. Available from: https://www.youtu.be/dC5yPKzXb50. [Last accessed on 2017 Mar 13]. Dattatreya K, editor. Rasaratnasamucchaya of Acharya Vagbhatta. Ch. 2, Ver. 81-82. 2nd edition. New Delhi: Meharchand Lachamandas Publication; 2010. p. 29. Mishra G, editor. Ayurveda Prakasha of Acharya Madhava. Ch. 4, Ver. 7-8. 2nd edition. Varanasi: Chaukhamba Bharati Academy; 2007. p. 410. Parashuram S, editor. Sharangadhara Samhita of Acharya Sharangadhara. Ch. 2, Ver. 1-2. 6th edition. Varanasi: Chaukhamba Surbharti Prakashan; 2006. p. 144. Kulkarni D, editor. Rasaratnasamucchaya of Acharya Vagbhatta. Ch. 2, Ver. 83. 2nd edition. New Delhi: Meharchand Lachamandas Publication; 2010. p. 30. Available from: https://www.youtu.be/TE2Wm_ixn4Y. [Last accessed on 2017 Mar 13]. Kokate CK. Pharmacognosy. 2nd edition. Pune: Nirali Prakashan; 2008. p. 6.13, 6.17, 6.42. Anonymous. The Ayurvedic Pharmacopoeia of India, Part II. Appendix-3 (3.3). Vol. 1. 1st edition. New Delhi: Dept. of AYUSH, Ministry of Health and Family Welfare, Government of India; 2007. p. 191. Anonymous. The Ayurvedic Pharmacopoeia of India, Part II. Appendix-3 (3.2). Vol. 1. 1st edition. New Delhi: Dept. of AYUSH, Ministry of Health and Family Welfare, Government of India; 2007. p. 190. Anonymous. The Ayurvedic Pharmacopoeia of India, Part II. Appendix-3 (3.8). Vol. 1. 1st edition. New Delhi: Dept. of AYUSH, Ministry of Health and Family Welfare, Government of India; 2007. p. 199. Anonymous. The Ayurvedic Pharmacopoeia of India, Part II. Appendix-2, (2.2.10). Vol. 1. 1st edition. New Delhi: Dept. of AYUSH, Ministry of Health and Family Welfare, Government of India; 2007. p. 14. Anonymous. The Ayurvedic Pharmacopoeia of India, Part II. Appendix-2, (2.2.10). 1st ed., Vol. 1. New Delhi; Dept. of AYUSH, Ministry of Health and Family Welfare, Government of India; 2007. p. 13. Kashinath S, editor. Rasatarangini of Sadanand Sharma. Ch. 2, Ver. 52. 11th edition. Delhi: Motilala Banarasidas; 2012. p. 22. Savalgi PV, Patgiri BJ, Ravishankar B, Shukla VJ. Standardization of Swarna Makshika Bhasma and to Evaluate its Toxicity and Anti-Hyperglycemic Activity. Ph.D [thesis]. Jamnagar: Institute for Post Graduate Teaching & Research in Ayurveda, Gujarat Ayurved University; 2012. 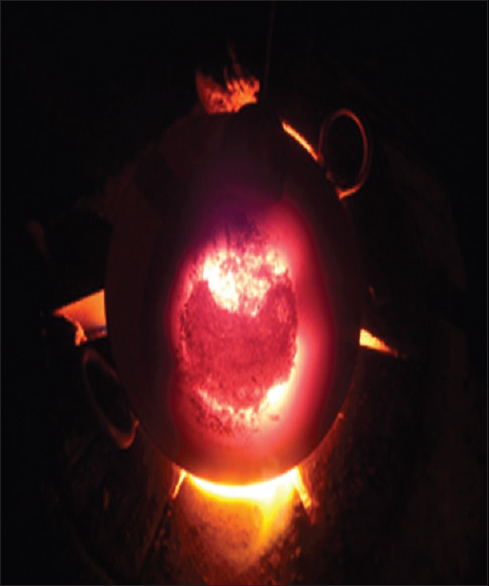 Available from: http://www.britannica.com/EBchecked/topic/484985/pyrometallurgy. [Last accessed on 2017 Mar 20]. Sahyoun C, Kingman SW, Rowson NA. The effect of heat treatment on Chalcopyrite. Phys Sep Sci Eng 2003;12:23-30. Available from: https://www.en.wikipedia.org/wiki/Stress_corrosion_cracking. [Last accessed on 2017 Mar 20]. Faris N, Rama R, Chena M, Tardio J, Pownceby MI, Jones LA, et al. The effect of thermal pre-treatment on the dissolution of chalcopyrite (CuFeS2) in sulfuric acid media. Hydrometallurgy 2017;169:68-78. Available from: https://www.en.wikipedia.org/wiki/Thermal_expansion. [Last accessed on 2017 May 11]. Available from: http://www.net.mkcl.org/WebFiles/Metallurgy.pdf. [Last accessed on 2017 May 11]. Gupta RK, Lakshmi V, Jha CB. X-ray diffraction of different samples of swarna makshika bhasma. Ayu 2015;36:225-9. Available from: https://www.en.wikipedia.org/wiki/Copper_extraction. [Last accessed on 2018 Dec 13]. Alafara AB, Kuranga IA, Folahan AA, Malay KG, Olushola SA, Rafiu BB, et al. A review on novel techniques for Chalcopyrite ore processing. Int J Mining Eng Mineral Process 2012;1(1):1-16. Anonymous. The Ayurvedic Pharmacopoeia of India, Part I. Vol. 1. 1st edition. New Delhi: Dept. of AYUSH, Ministry of Health and Family Welfare, Government of India; 2007. p. 27. Sharma S, Gupta M, Bhadauria R. Phytochemical variations in commercially available triphala powder: A well known dietary supplement of Indian system of medicine. Res J Med Plants 2014;8:214-22. Harris ED, Percival SS. A role for ascorbic acid in copper transport. Am J Clin Nutr 1991;54:1193S-1197S. Available from: http://www.robertbarrington.net/copper-and-vitamin-c-interactions/. [Last accessed on 2017 May 10]. Singh N, Reddy KR. Pharmaceutical study of lauha bhasma. Ayu 2010;31:387-90.